I always say that when I was diagnosed with breast cancer, I was single. That’s not entirely true; I had a boyfriend. I don’t talk about him much. He was a very nice guy and I thought I loved him. He, however, didn’t love me back. I stayed with him for much longer than I should have. There’s this phrase that I couldn’t stop thinking about in the years after my mastectomy. “Damaged Goods.” It means different things to different people, and in my case I just couldn’t believe that anyone would love me after my breast cancer surgeries. It’s one of the reasons I stayed with a man who didn’t love me. A relationship can’t last long without love, and after we had been dating for about two years, that boyfriend and I finally broke up. I had a couple of dates, but I never got to the point where I told another man that I had had cancer. Ed and I knew each other for years. We both went to the same church and said “Hi” to each other every Sunday. I had a little crush on him. Finally, I worked up the nerve to ask him out for coffee. It only took one date to know that we were going to start seeing a lot of each other. And when I saw him smiling at me from across the gym Easter morning during our church’s brunch, I knew. I knew he didn’t care what I had gone through. I knew he didn’t think of me as damaged goods. He gave me a smile that was just for me. Two years into our relationship, he pulled out a ring and asked me to be his wife. 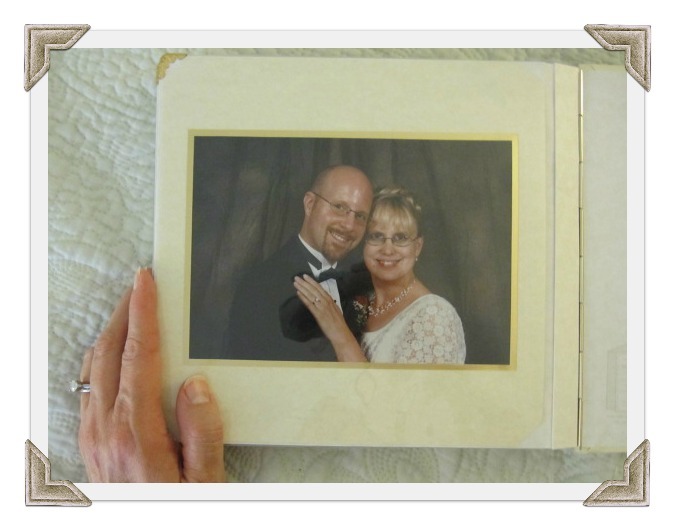 I seldom think about my wife’s history with cancer. Maybe it’s because I’m wearing blinders, or maybe it’s because there’s really nothing different about her that’s due to her cancer. Although it’s a part of who she is, I tend to focus on other things a whole lot more. Ten years into our marriage, we both focus on a whole lot more. We focus on our daughters and our family. We go through highs and lows, like any other couple. We fight. We make up. He’s not perfect; I’m not perfect. But never once in our whole relationship have I ever thought about those words again. I’m not damaged goods, and Ed’s love proves it to me. I’m writing today about “Love” for the Spin Cycle at Second Blooming. Click on the button above to read more about love! I have got to stop reading this at work! Love you Ginny! Great story! I am so glad you found someone who loves you for you, no matter what you've gone through. I finally found that for myself as well. Love (and life!) is truly amazing when that happens. I have to agree with what Co-Pilot Mom said above, sometimes it IS good to see ourselves through another's eyes. I love this! So sweet. What a great love story! This was absolutely beautiful! think cancer survivors are the strongest people I know..Not only because of the pain they endured but the emotional side that comes with dealing with it and the way you feel after. I've gone through ovarian cancer myself and thought I'd never have another child again…My baby is 2 and I have a wonderful husband who's been there for everything..! Love your story! Wow! Reading this makes me believe that love is still possible. Holding out hope. Thanks for the WHOLE truth! Aw, thanks! I didn't mean to make you get out the tissues! I'm so happy that you found a man like Ed, there aren't that many like him out there. I had a heart condition as a kid and had a surgery that left me with a ghastly 6 inch scar running down my chest. I used to be very self conscious about it but my husband says he doesn't really notice it at all. Ok. wiping tears as I type. Wonderful post, wonderful couple. I'm so glad you got through the ickies and found your way to your Ed. God has plans for us, we rarely see them, or know when we are on the path. But in hindsight, it's easy to see his handiwork! Do you have a blog? I haven't been able to find your website to make a return visit! This post just made me smile! It's great how you knew the moment he was smiling at you. What a wonderful testimony to your husband! A parallel can be seen in your love story to how God loves us, imperfect that we are. Hi, Janet! I often think that many of my blog posts could easily be turned into devotions. I have some of them in a separate file, waiting for me to look up some Bible verses! Ed is an awesome guy! I often think of myself as "damaged goods," too, even now, but I know Hubs doesn't see me that way. I was thinking after I wrote this post that a lot of women probably think this way over different things. I'm glad you have your Hubs in your life! Mara, you make me laugh! 😀 You're the best. This is so beautiful!! You are truly blessed to have him. This is something that you should somehow share with other young women with breast cancer – I"m sure they all worry about the same thing. You should submit this to a magazine or something. Thanks, Gretchen! I'm sure you're right…I may have to give this some tweaks and do that! This made me feel so warm and happy inside for you. I'm thrilled that you have that kind of love!